Serpents in the garden and devils in the wilderness. 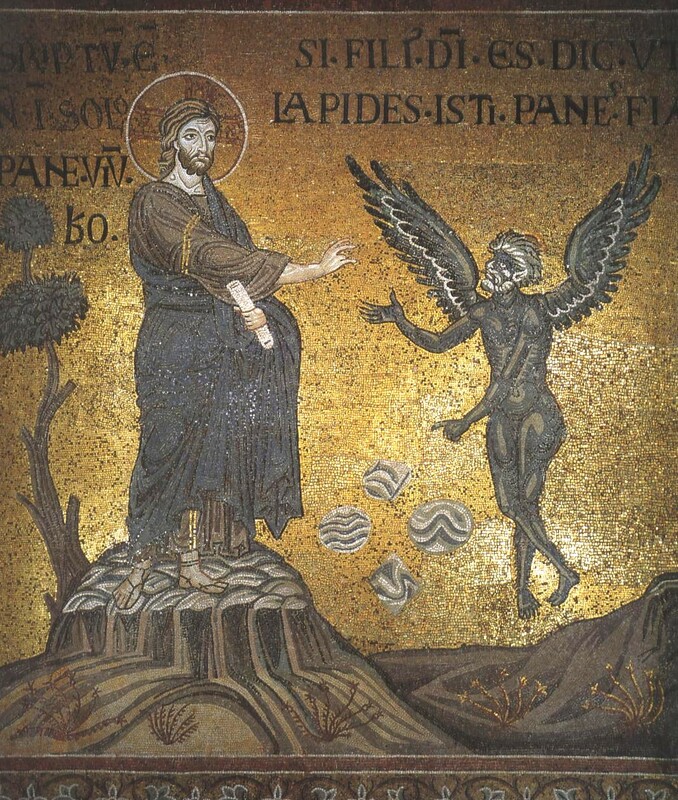 No matter which year or which gospel, the first Sunday in Lent always feeds us stories of temptation and confrontation between Jesus and that figure who has been named “the devil,” about whom there is much confusion — which, I assume, suits the devil quite well. The devil is a staple figure in more conservative expressions of our Christian faith, in ways that often embarrass or anger more progressive Christians. We’ve seen the devil’s name used to cover up a multitude of human sins, as anyone who looks different, prays different, lives different, or loves different gets lumped in with the devil. Satan, to too many, is just another name we use for anyone or anything unfamiliar or agitating. In the classic case of the pendulum swinging too far in the other direction, we who deplore this kind of scapegoating distance ourselves from anything that reminds us of it, making “the devil” a laughable stereotype of backward religion and denying our own daily struggles with temptation. C.S. Lewis, the Christian author and apologist remembered perhaps best for his Chronicles of Narnia, described this dynamic well in his satirical novel The Screwtape Letters. 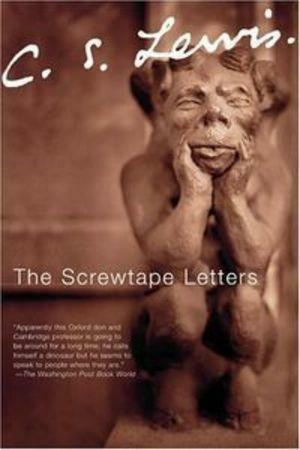 First published during World War II in 1942, The Screwtape Letters takes the form of a series of letters from an elder devil, Screwtape, to his younger nephew, Wormwood. They are both bureaucrats in Satan’s service, and Screwtape is advising his nephew in the devilish arts, how to win souls away from God. Lewis calls the phenomenon I have observed in too many conservative Christian communities, whose “excessive and unhealthy interest” with the devil gives Satan too much power and credit, a kind of magical thinking and hails these sorts of people as “magicians” whose distraction with the devil borders on devotion. But Lewis has a name for people like me, and maybe communities like ours, as well. People and parties committed to objective reality, cold hard facts, and psycho-social explanations for every variety of human experience he calls “materialists” — not in the sense of “materialism,” the word we use for an unhealthy love of consumer goods, but in the sense of a slavish devotion to what can be seen and known and studied and mastered: the material world. Our condescension toward anything we do not believe or understand makes us susceptible to all kinds of attacks that we never see coming, even while we are in their grip. About a third of the way into the book, Screwtape addresses this issue in one of his letters to his nephew. 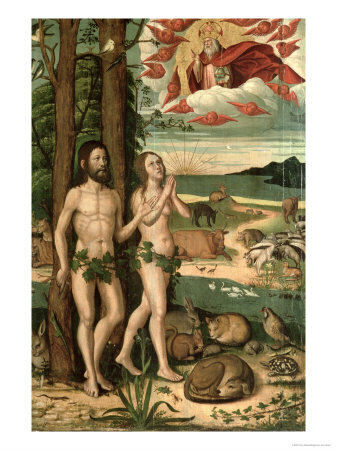 It is with all these misgivings and misunderstandings about the devil that we approach the story of Adam and Eve in the Garden of Eden, and Jesus in the wilderness, on the First Sunday in Lent. In the garden we get the story of a serpent and a tree, or a wyrm in the woods, and the perversion of knowledge into shame. The stories from Genesis are so rich with symbolism and inexhaustible meaning that we’ll be returning to them for most of this coming summer. There are many ways to make sense of this story, and one of them is that in the garden God marks the boundaries that distinguish between humanity and God. “You may freely eat of every tree of the garden; but of the tree of the knowledge of good and evil you shall not eat, for in the day that you eat of it you shall die” (Gen. 2:16-17). Fruit, or food, is equated with knowledge — both being necessary for life. God affirms humanity’s need to be sustained, not only by food but also by intellectual engagement with the world. We are meaning-making creatures, who long to understand our experience. Perhaps alone among God’s creatures, we reflect upon the meaning of our own existence. And that, God does not prohibit. But God issues a strong warning about our desire to claim mastery over what is good and what is evil. Those categories of thought lead almost inevitably to forms of judgment that are reserved to God alone, and once humanity sets out to know and to name good and evil all kinds of insidious harm occurs. We see this illustrated in the story as the woman and man eat the forbidden fruit and know themselves in a new way, in their nakedness, which they immediately move to cover. This isn’t the only way to interpret this story, but if we do read in this way we are led to reflect not only on the origins of human suffering, but on our own individual and communal suffering as well. In what ways does our strong desire to be able to label people and circumstances “good” or “evil” lead us into relationships that leave us vulnerable to shame, and anger, and violence? Can you think of a time when you followed the voice inside your head, or your gut, or your heart that seemed so sure it knew the truth about another person’s life — only to discover that you were tragically wrong? If so, then you know what it’s like to be tempted by wormwood, the serpent in the garden, an all-too-real experience that makes the question of the “reality” of the devil practically irrelevant. Following his baptism, the event at which Jesus saw the Spirit of God descend and rest on him and heard God’s voice name him as God’s own Beloved, Jesus is led out into the wilderness where he was also tempted by the devil. This time, instead of fruit from a tree, the devil acknowledges Jesus’ hunger, the result of his fasting. “If you are the Son of God, command these stones to become loaves of bread.” But Jesus answers, “It is written, ‘One does not live by bread alone, but by every word that comes from the mouth of God.’” (Matt. 4:3-4) Food and knowledge are once equated with each other, but unlike the man and woman in the garden, Jesus does not take the bait to rely on his own knowledge, but on the wisdom of God. Can you remember a time in your life when poverty, or isolation, or deprivation took you to a place where you were ready to give up on all that you know to be true? When you were ready to trade in your trust that God will provide with a lower faith in the reliability of the world’s wisdom, in which there is only so much bread to go around and you should feel entitled to get yours before it’s all gone? If so, then you’ve met the devil. Next Jesus is taken to the holy city and set on top of the temple, where the devil goads him to demonstrate his divinity by throwing himself from the heights and forcing God to rush in and save him from his own death. Here the devil betrays a woeful lack of knowledge about how and where God chooses to work in the world. Rather than choosing a handful of people to love, and sparing them from death and suffering, God chooses to to love all of creation and to join us in the fullness of our experience, including and especially death. Have you ever found yourself at the crossroads of a difficult decision, trying to talk yourself out of a necessary task by reassuring yourself that God would never want you to suffer so much? If so, then you’ve met the devil. Finally, Jesus is taken up to a very high mountain and shown all the nations of the world. Satan, that liar, makes a ridiculous offer, that Jesus will be given the world if only he will bend the knee and worship him. This is the very baldest of lies, because we know that the devil is offering something that is not his in the first place. But, it’s not so ridiculous a scenario, as the world is always trying to convince us that realists, pragmatists, materialists even, need to be prepared to deal with the cold hard fact that the world is a tough place, with no room for the ethics of love, forgiveness, justice and compassion that God in Christ Jesus is offering. Have you ever found yourself in a position of authority, where you had the responsibility of making significant decisions that would affect the lives of many others, perhaps your entire family, or your workplace, or the neighborhood, or the world? Have you heard within yourself the inner struggle between the voice that calls you to do what is right, and the voice that calls you to do what is expected? If so, then you’ve met the devil. Jesus, unsurprisingly, sidesteps all of the devil’s lures and sends him scuttling off. We are not always as sure in our responses. Perhaps that is why we fear talk of the devil to some degree, because we suspect we’ve lost a match or two to his wiles. In other words, the biggest lie of all is that it is somehow we who are locked in combat with the devil and all the powers of death, when in reality it is God who has already decided the outcome of that conflict. God is for us, and for all the world, and against that unshakeable fact all the devil’s lures and lies are powerless. So we will jeer and flout and mock the devil, who has already lost the war. The congregation in which I grew up, St. John’s Lutheran Church in Des Moines, Iowa, used to take high school groups up to the Boundary Waters for weeklong canoe trips in the summer. We went through a Christian camping organization that provided the canoes, the backpacks, the food, and wilderness guides who were also trained to lead us in nightly bible studies. I don’t remember the bible studies at all, but I do remember the joy of floating out on the water in the middle of the cold, blue lakes that separate the United States from Canada. Watching hawks draw circles in the sky. Listening to the crackle of the campfire and the unfamiliar combination of sounds and silence in the night. In this Season of Creation, it’s this morning’s emphasis on the wilderness that I find most difficult to preach. The Sundays of this season move along a story arc that began with creation and alienation, and that end with passion and new creation. It was easy to talk about creation in the context of the forest trees, and alienation in the context of our relationship to the land. To try and imagine the wilderness as the place of passion is more difficult though – partly because we are so thoroughly entrenched in city life, not wilderness life; and partly because the wilderness is so densely occupied by metaphor that it’s hard to talk about the wilderness as it is without turning it into a symbol for us as we are. The more I thought about it though, the more I realized that it’s not just difficult to talk about the wilderness without talking about humanity – it’s actually impossible. Consider this: the first Sunday of this season, we focused on forests which are filled with what? Trees. The second Sunday we focused on land, which is comprised of what? Soil. Next week we’ll consider the plight and the potential of rivers, which are made of what? Water. But today we are talking about the wilderness, which is filled with what? 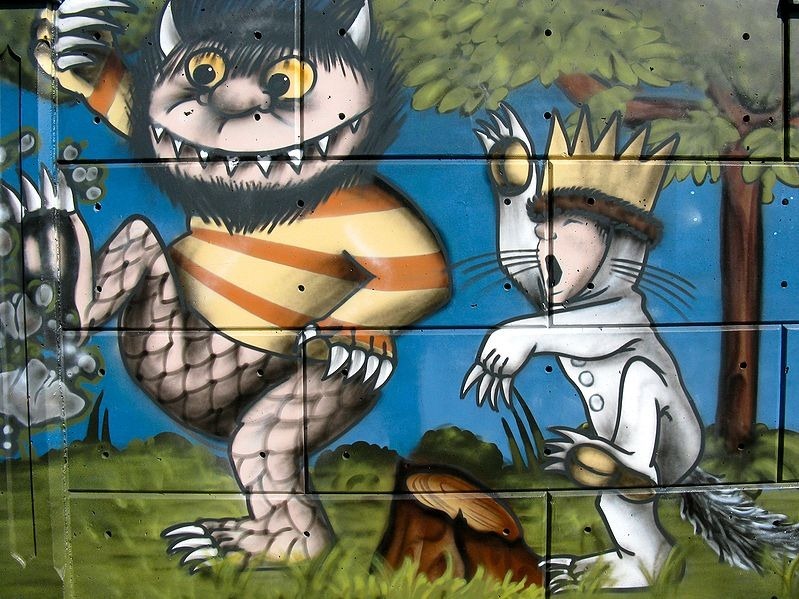 Wild things? Wild animals? Wild plants? Wildness? Wild isn’t a thing, it’s an idea. It’s the place where we aren’t. It’s the runaway’s refuge, the criminal’s hideout, the refugee’s journey, the traveler’s nightmare. It is unmastered territory, which is precisely why it is often presented as the place where people go to master themselves. This, I suppose, is what makes the wilderness a place filled with passion. Passion, not only in the sense of being filled with desire, but also being filled with suffering – such as when we talk about Jesus’ passion and death. That’s a pretty deep thought now, isn’t it? Desire and suffering are flip sides of the same coin, and the wilderness is the unmastered landscape where human beings go to master the untamed geographies of their hearts and souls. That’s certainly what seems to be going on in the gospel reading this morning. Jesus rises from the waters of baptism to the sound of God’s voice declaring that he is God’s own beloved child, the one on whom God’s favor rests. Immediately thereafter, the Spirit leads Jesus into the wilderness precisely so that he can be tempted by the devil. During that time, Jesus fasts for forty days and forty nights, getting empty so that he can be filled, being hungry so that he can be fed. Then he returns to civilized areas and begins his work. Very coincidentally, I took part in a bible study on this passage from Matthew the week before last. I was with a group of pastors discussing leadership in the church, and the trainer working with us used this story to talk about how healthy ministry takes place. It’s a three-act play: first the baptism, then the temptations, and finally the work. Too often, when we think about leadership we jump straight to the final act, the part about the work. Sustainable leadership though, we were invited to think, comes first from the deep knowledge that you are baptized, that you are looked on with the eyes of love and claimed as one of God’s own children. This is critical, that our work comes from a place of security and confidence that we are already claimed by God. Our leadership, our work, our relationships, our pastimes – all of that can feel hollow, empty, unsustainable if we are using them to try and fill a hole left by anxiety that there is something unseen, unknown, or unloved about us. In his baptism, as in ours, Jesus learns that he is God’s beloved, now and for always. But, what to do with that knowledge? What does it mean to be beloved of God? Is it license to conquer? Is it power to subjugate? Is it assurance of wealth or prosperity? Is it cause to look down upon others? Is it freedom from responsibility? The story of Jesus’ temptations in the wilderness reflect the very real struggles each one of us has to face in our own lives. As one of the pastors in the bible study said, “you can’t be tempted with things you don’t want.” Jesus is tempted with bread, religious authority and worldly power. Temptations ranging from daily necessities to lifelong ambitions, and certainly understandable desires for someone born, as a Palestinian Jew under Roman occupation, into hunger for change. We might want different things, and so face different temptations. Perhaps we want stability above all else, so we are tempted to ignore opportunities for change and growth. Perhaps we crave freedom, so we are tempted to avoid commitments and obligations that might teach us steadfastness and responsibility. Perhaps we desire comfort, or admiration, so we amass wealth and miss openings to encounter God in the suffering of the world. Perhaps we want love so badly that we forego the time and honesty it takes to truly come to know and love ourselves. Perhaps we want power and respect so much that we treat those around us like objects, and trade community for control. Until we face these wants, these passions, these sufferings; until we remember that our truest identity is rooted in love, all our work in the world will be compulsive, unhealthy and unsustainable. This three-act play of baptism, temptation and work can be applied in a variety of contexts. I certainly would invite you to spend some time thinking about your own life through the lens of this story, and consider your own wants, desires, sufferings and temptations. What do they reveal about the motivations behind your work, your rest, your relationships? What would happen if you brought a remembrance of your baptism into each of those arenas of life? How would your home, your office, your community be transformed for deeper ministry if it was rooted in love? During this Season of Creation though, I want to apply this three-act story specifically to our relationships with God’s creation, of which we are obviously a part. In a webinar on presence-full leadership earlier this week, MIT teacher and researcher Otto Scharer shared three disturbing numbers that illustrate the state of division in our world today. The first number is 1.5 – Scharer called this the Ecological Divide, representing our disordered relationship with God’s creation. 1.5 represents the rate at which we are consuming the planet’s natural resources relative to how quickly they are regenerated. The second number is 2.5 – Scharer called this the Social Divide, representing our disordered relationship with each other. 2.5 billion is the number of people living below the poverty line worldwide, and represents a failure of values on the part of the global community. The final number is 3.0 – Scharer called this the Spiritual Divide, representing our disordered relationship to ourselves. The World Health Organization says that almost three times as many people die from suicide than from war and other forms of homicide. Otto Scharer asserts, and I’m inclined to agree, that these numbers are connected. Our fractured relationships with the planet, each other, and ourselves reflect ways of living completely detached from any sense of being made in love for love, and point to the need for us to master the passions and temptations that lead to so much of our suffering and the world’s as well. Too often conversations about the environment treat the topic as one in which information alone is the answer. As if, all we needed was to be told that our patterns of waste disposal or our reliance on gasoline was killing the earth. I think about anti-smoking initiatives though, and suspect it will take more than information to change our behavior. Decades of warnings from the surgeon general didn’t do much to deter people from smoking. It was acknowledging that cigarettes are addictive, it was public health campaigns that introduced the idea that smoking might take you away from your loved ones, it was legislation that shifted some of the costs of smoking-related illness back to smokers in the form of cigarette taxes that began to shift the tide. I am convinced that the same things need to happen if we are going to change the patterns of behavior that are killing the earth. Yes, we need information about the rate of environmental degradation. We need movies like An Inconvenient Truth and Food, Inc. Beyond that though, we need to call our addictions to cheap gas, cheap manufacturing, and cheap goods what they are. Addictions. We need to tell the truth about the ways that our patterns of production and consumption are alienating us from the rest of the world, where goods are produced in conditions few to none of us have ever had to endure. And we need to fearlessly enter the wilderness of our own hearts to ask what price we ourselves are paying in order to try and sustain these planet-destroying patterns of living. We live in illness-infused environments, anxious to know if there will be anyone to care for us once we can no longer fill our roles in the cycle of over-production and over-consumption, and as the World Health Organization’s numbers show us, we are literally killing ourselves. In the wilderness, Jesus fasts for forty days and forty nights, getting empty so that he can be filled, being hungry so that he can be fed. Then he returns to civilized areas and begins his work. We, too, are invited to take stock of what we are filling ourselves with and to begin the process of emptying ourselves to make room for what God is doing in and for the world. People of God, in this Season of Creation the message is clear: the planet is in peril, and there is work to be done. But we do this work by faith, not from fear. The scope of the task before us is too large to take on if we don’t plan for sustainability. As Christians, we find our sustenance, our most renewable resource, in the gift of life that comes to us at the font and the table, reminders that we are God’s own beloved and that in God’s economy there is always enough for everyone.